Patient satisfaction is a feeling of satisfaction or dissatisfaction from a patient that happened after the patient feel the product result (services) compare to what they expected. At this research, researcher correlate the patient satisfaction with competency. So that, this research is designed to analyse the influence between competency to services quality, the influence between services quality to patient satisfaction and the influence between competency to patient satisfaction. The study was conducted at the NU Cipta Husada hemodialysis clinic with an analysis unit all routine patients by providing questionnaires. This study was conducted with one short study. With a causality approach. Data analysis using SEM Technique. 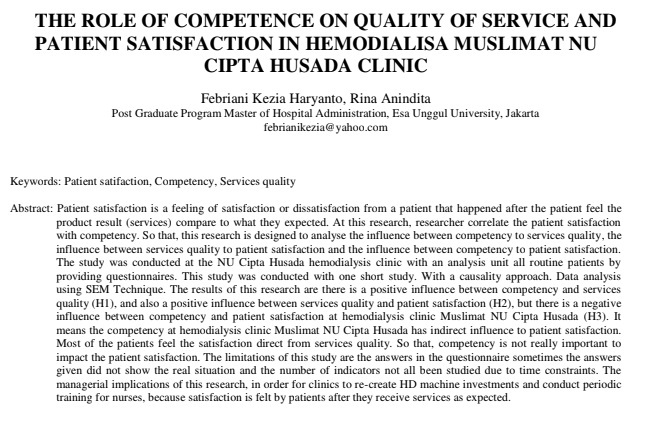 The results of this research are there is a positive influence between competency and services quality (H1), and also a positive influence between services quality and patient satisfaction (H2), but there is a negative influence between competency and patient satisfaction at hemodialysis clinic Muslimat NU Cipta Husada (H3). It means the competency at hemodialysis clinic Muslimat NU Cipta Husada has indirect influence to patient satisfaction. Most of the patients feel the satisfaction direct from services quality. So that, competency is not really important to impact the patient satisfaction. The limitations of this study are the answers in the questionnaire sometimes the answers given did not show the real situation and the number of indicators not all been studied due to time constraints. The managerial implications of this research, in order for clinics to re-create HD machine investments and conduct periodic training for nurses, because satisfaction is felt by patients after they receive services as expected.